Progress continues with the new building and from August, Mearns Academy will be sited on the brand new Community Campus. The facilities for learners will be excellent and indeed the whole community will benefit from the site including a community library, theatre and hugely improved sports facilities. However it is not the case that this development is the only time building works have taken place at the school since secondary education started in 1895. From the simple increase in pupils attending, to the raising of the school-leaving age and the changes in curricular provision for girls, there have over the decades been various stimuli for changes in accommodation at the school. Up until 1931 there were 3 main buildings: the central accommodation where advanced subjects were taught and also the Infant School and the former Episcopal School. Further additions were made in 1934 when additional classrooms were said to have ‘greatly improved’ matters. Also in 1937 further classrooms were added as well as the (current!) gymnasium. Science and homecraft classes were added in the north wing in 1954 and March 1966 saw the formal opening of the much extended facility to support secondary education. This was welcomed enthusiastically by the pupils – not merely because the then Senior Chief Inspector performing the ceremony also granted the school an additional holiday to celebrate the occasion! 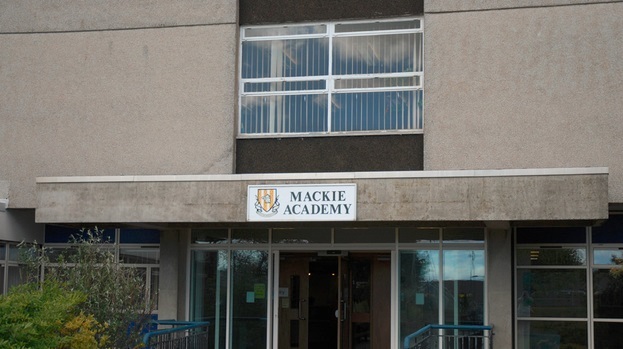 The final phase of major development of the current site was completed in 1986 but as the school roll has consistently risen, so, to present day has the need for extra classrooms. Similarly in 1948 the rector Mr Stewart commented: ‘The roll has increased greatly on account of the raising of the school leaving age. As a result, accommodation is heavily taxed’. ‘During the recent cold weather very low temperatures were recorded and the children suffered severely! Similarly, two years later the 1933 report again lamented the ‘highly inadequate’ heating system. Furthermore, it was not just lack of warmth that drew concerns. In 1911 the School Board commented on ‘classrooms surrounded by dark corridors – noisy, cold and draughty’. Similarly, the fact that some classrooms were below the level of the surrounding ground, left them very damp with water oozing through the flagstone floors. Problems were also encountered in the playground described as early as 1896 as being ‘in a very unsatisfactory condition’. Well into the 1950’s, pupil contributions to the school magazine refer frequently to the playground as ‘a bog’, ‘a pool of mud’ and ‘very dangerous’. Thankfully such aspects have long since been addressed and additionally, as early as the 1930’s very positive use was made of the ground at the rear of the school; namely the creation of allotments for growing flowers and vegetables. This was through the efforts of former teachers Mr Willie Low and Mr George Watson and their work was appreciated by many, even if during the Second World War much of the cultivated ground was dug up to allow precautionary air-raid trenches to be dug. Happily there is still cultivation of produce in this area of the school and of course the outside space at the school has been greatly enhanced since the creation of new playing fields in 1995. No more trudging up to Memorial Park since then! However, even such improved sports facilities will be seen as a very poor comparison to the fantastic sports accommodation in the new campus. With a full size sports hall, a sprung floor gym, state of the art fitness suite and 3 outdoor pitches (including one all-weather pitch) the pupils experience will be transformed. Indeed the whole learning environment in the new campus will be tremendously positive and will give all learners a context in which to thrive. Given the trials and challenges regarding accommodation in the school since 1895, one might really conclude: not before time! This entry was posted in Local Blog and tagged education, Mearns.